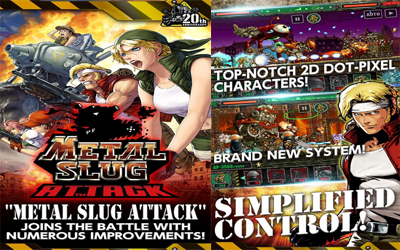 Previous version METAL SLUG ATTACK 2.5.1 apk for Android will help you to downgrade or install older app easily. This is one of the best Strategy apps. SNK Playmore seems to still maintain formula line defense the same as Metal Slug Defense, only this time it will be added a few new features that do not exist in the previous series, such as variations in new modes, features upgraded troops, co-op multiplayer, as well as increased content and sound. This genre has been adapted for mobile devices and has also unique gameplay that Tower Defense. Moreover this game also allows you in real time directly. For control is made as simple as possible to adjust the mobile device you have. Surely Metal Slug Attack still carrying the dot-pixel 2D graphics as in the other game series Metal Slug. You can directly download it for free. This game is better than MSD because it can upgrade unit deeply. It is good like metal slug defense. The different are marco,tarma,eri,fio can equip their weapon.